RESTON, VA--(Marketwired - May 18, 2014) - More companies plan to hire MBAs and other business school graduates in 2014, according to a global survey of employers out today. Some 80 percent of business school recruiters plan to hire MBAs in 2014, up seven percentage points from last year and 30 percentage points higher than 2009, in the heart of the economic crisis, when just half of employers hired MBAs. The 13th annual Corporate Recruiters Survey of 565 employers from 44 countries was conducted in February and March by the Graduate Management Admission Council, which administers the GMAT exam on behalf of business and management programs worldwide. The survey, including 32 of the top 100 companies in the FT 500 and 36 of the Fortune 100, was conducted in partnership with EFMD and the MBA Career Services and Employer Alliance. 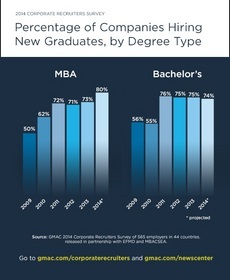 "More companies in all sectors and across the world plan to hire business school graduates, with projected hiring rates the highest for all degree types since the Great Recession started in 2009," said Sangeet Chowfla, GMAC CEO and president. "MBAs have always been valued by employers, but this survey shows that as the economy improves, employers see MBAs as a good investment into their future." The optimistic hiring outlook for MBAs and other master's-level business graduates comes as fewer companies are focused on overcoming economic challenges. Companies focused on growth and expansion are more likely to have improved hiring plans. The upbeat forecast echoes the general decline in the percentage of companies reporting a focus on overcoming economic challenges, from 58 percent in 2009 to 25 percent this year, as well as reducing costs, from 66 percent in 2009 to 45 percent this year. At the same time, the percentage of employers planning to hire new bachelor's degree graduates is holding steady, down one percentage point from the 75 percent that hired bachelor's graduates in 2012 and 2013. "This year's survey paints a very positive picture for the business education sector and clearly shows how companies and recruiters value the whole portfolio of business degrees. Despite all of the doom and gloom, the clear message from the market is that business schools are providing the talented, bright individuals that companies need," said Prof. Eric Cornuel, CEO & director general of EFMD. Some 83 percent of employers in Asia-Pacific, 61 percent of European employers, and 86 percent of US employers plan to hire MBAs this year, all increases from 2013. Half of the employers surveyed plan to hire master in management graduates, up from 45 percent past year and 18 percent in 2009. 45 percent of employers plan to hire master of accounting graduates, up from 36 percent last year and 17 percent in 2010, the first year data were available for these grads. 44 percent of employers plan to hire master in finance graduates, up from 39 percent last year and 41 percent in 2012, the first year data were available for these grads. 74 percent of employers plan to hire bachelor's degree graduates, down slightly from the 76 percent peak in 2011 but much higher than the 56 percent that hired in 2009. Out of communication, managerial, teamwork, leadership and technical skills, employers say communication skills are the most important ones they seek in new hires, on average twice as important as managerial skills. Median base salaries employers expect to offer MBAs are US$95,000 in the US and US$69,000 in Europe, as compared with US$50,000 for US bachelor's graduates and US$41,000 for European bachelor's graduates. Projected median MBA base salary in Asia-Pacific is US$21,340, reflecting much lower per-capita income in the region. "With the global economy moving forward at more solid pace in 2014, MBA CSEA is pleased to see that 80 percent of companies intend to recruit MBAs this year, that salary gains are being realized for MBAs in regions such as Asia-Pacific, and that industries such as consulting have been increasing recruitment since last year. These are all positive signs for MBA graduates and talent in the pipeline," said Mark Peterson, president of the MBA Career Services & Employer Alliance and director of graduate business career services, Iowa State College of Business. For the 2014 Corporate Recruiters Survey report, go to gmac.com/corporaterecruiters. About GMAC: The Graduate Management Admission Council (gmac.com) is a nonprofit education organization of leading graduate business schools and owner of the Graduate Management Admission Test (GMAT exam), now celebrating its 60th year and used by more than 6,000 graduate business and management programs worldwide. GMAC is based in Reston, Virginia, and has regional offices in London, New Delhi and Hong Kong. The GMAT exam -- the only standardized test designed expressly for graduate business and management programs worldwide -- is continuously available at approximately 600 test centers in 113 countries. More information about the GMAT exam is available at mba.com. For more information about GMAC and additional resources for media, please visit gmac.com/newscenter. Percentage of companies hiring new graduates, by degree type. Source: Graduate Management Admission Council 2014 Corporate Recruiters Survey.